Wicked Jackpots Casino was formed in the year 2015. The casino is governed by Cassava Enterprises (Gibraltar) Limited that is fully licensed to offer online games by the Government of Gibraltar. The casino is overseen by Gibraltar Gambling Commissioner. It is also a member of the United Commissions. Since it was formed, Wicked Jackpots Casino has been able to offer excellent gaming experiences to its client base. Its gaming platform is very convenient, reliable and easy to use by its clients. Having a wide variety of online casino games including slot and table games, you can be assured of a thrilling online casino experience to suit all your preferences. Wicked Jackpots Casino has among the best progressive jackpots which are easy and fun to play. Progressive jackpots are responsible for the big wins in this casino. Some of the jackpots games offered in Wicked Jackpots Casino are; Saved by the Bells, Ghost in the Shell, Irish Riches, Snack Time and many others. Wicked Jackpots Casino offers most of the top played online slot games. The casino offers the best and most thrilling slot games you could think of and they have different themes too. Some of the slot games are; Starburst, Cleopatra, Ted, Beat the Bobbies, Stampede and so many more. Wicked Jackpots Casino has the most impressive table game in the gaming industry. It has many table games for its clients to choose from. Players get to access these slot games on the go. The table games available include; Baccarat, Casino Hold’Em, Oasis Poker, and Swap the Flop. Wicked Jackpots Casino is one of the best live dealer games providers. Live dealer games intention is for players to enjoy the actual table casino gaming experience while at the luxury of their seat at home. Wicked Jackpots Casino games that have live dealers are: Roulette, Blackjack, Dream Catcher and Caribbean Stud among others. Wicked Jackpots Casino has several bonus opportunities to its client base who play the various online casino games they provide. Wicked Jackpots Casino has a welcoming bonus for its clients. New gamers get a welcoming bonus of up to 100% for £777. Be a part of more thrilling casino bonuses like free 1000 spins weekly. You can also get up to £250 promotion in bonus through the Pandora’s Box and when you add Game of the Week and loyalty Coins you will be walking in supplementary bonus cash. There is a VIP Lounge for the hottest and thrilling online bonuses. There are four posh VIP levels which offer the tremendous bonuses. You will get surplus cashback, exemplifying offers, personal manager, unique gifts and boost VIP bonuses. Players get lots of privileged treats through emails and SMS. This exclusive treat includes giveaways, free spins, and extra bonus codes and that you have to do is subscribe to their SMS and emails. 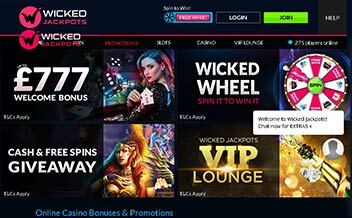 Wicked Jackpots Casino consistently adds new games, contests, promotions, and bonuses for its clients. It is hence important for its clients to have the most recent updated information that involves its games, and its tournaments. 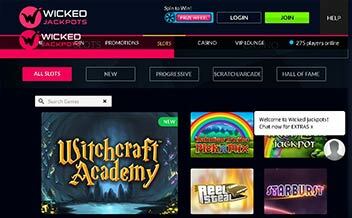 The casino website has a section which provides recent information and news that is important to the gamers or new players who want to be part of the Wicked Jackpots Casino. 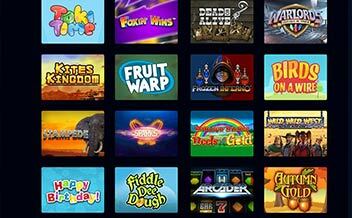 Wicked Jackpots Casino is powered by various software’s to provide you with a stable gaming experience.  This software’s are well recognized and fully licensed. The software’s are NetEnt, 888 Gaming, WMS (Williams Interactive), Barcrest Games, Dragonfish (Random Logic) and IGT (Wager Works). Players can deposit via; MasterCard, Neteller, Visa, Wire Transfer, Paysafe Card, Visa Debit, Maestro, and EntroPay. Withdrawal methods are; Visa, Visa Debit, Wire Transfer, MasterCard, Maestro, PayPal, and Cheque. Wicked Jackpot Casino has restricted some certain countries from playing its games. These countries are; Kenya, France, Denmark, Spain and The United States. Wicked Jackpots Casino allows the following currencies; CAD, EUR’ and USD. Wicked Jackpots Casino supports English as their only language. Wicked Jackpots Casino is available for both personal computers and mobile phones. Gamers can access the casino online through the browser. The web version of the casino provides users with all the games that the casino has to bid. The casino supports some of the major web browsers, like, Chrome, Firefox, Opera and many others. Wicked Jackpots Casino layout is easy to circumnavigate. The casino’s online site has a widespread set menu to make it easy for gamers to move around the site. The network enables the gamers to enjoy the experience and be comfortable as they are playing the online games. Wicked Jackpots Casino values its gamers security very much. For this matter, the casino has taken measures to ensure that its clients are protected. The casino has strong firewalls that help keep client’s information away from the hands of hackers, conmen and identity thieves. It is also secured with SSL encryption. Wicked Jackpots Casino support is always available 24/7. You can get through to the support team via telephone and email. Players can be assured that the casino’s support staff will attend to their queries within a reasonable time frame. Their phone number is 0800-279-3222 in the UK which is toll- free. There is a VIP section for loyal clients. It has numerous deposit methods. Has high-quality customer services to fit every client’s specs. It has very few table games. It has low withdrawal limits after wins. It lacks more classical games. 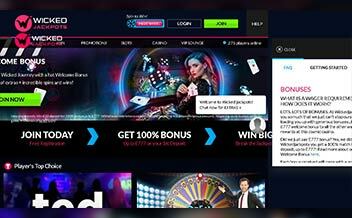 Wicked Jackpots Casino is capable and well designed for today’s generation gaming expeditions. It values its players who are assured of the most thrilling unforgettable gaming experience. Be a part of it today and let your gaming needs be satisfied.